You get out the hose. When I was younger I used to dream, almost nightly, that I was swimming. Usually I was in the ocean but sometimes I was holding onto a raft in a river, going over rapids and hills. Those dreams have pretty much stopped but I had one the other night and it made me remember what it felt like to be little. Clark is a lot like me. He is full of energy and he skitters around from one thing to another. Sometimes he gets all charged up and somersaults around the house, crashing into things, unsure what to do with his arms and legs. He has started swimming in the deep end of the pool, this year, with a life jacket. He fearlessly jumps into the deep water over and over. The water plunges way over his head and he pops back up smiling and then he climbs out and does it again. You can tell how happy his usually restless arms and legs feel with the viscosity of liquid working against them. I wonder if he dreams like I do. This post is part of You Capture. As always, you can see the rest of the linker-uppers over at I Should Be Folding Laundry. I am off to check them out myself, now. 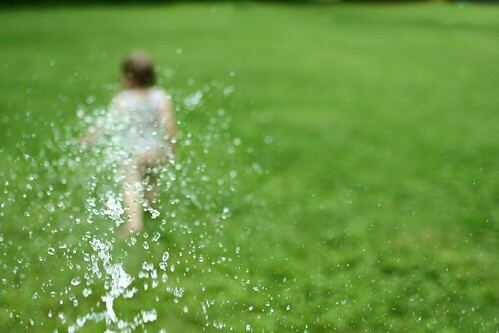 Love your captures- the shot from the back of her running through the sprinkler is fabulous! Adorable and arty at the same time. The look on her dirty face is too cute! :D But I love that second to last pic the mostest! 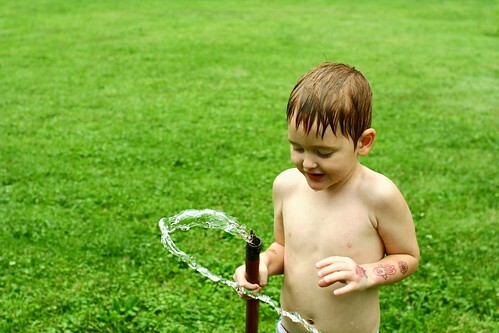 Such fun in the hose. 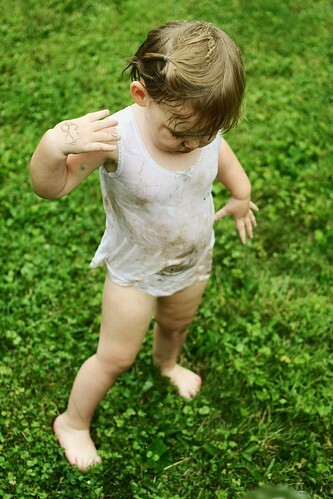 What a fun way to clean messy kiddos! Love the behind shot as well! FUN! Clark and Alice and Bob R. all need to come to camp Kitten for a week this summer. We all deserve to spend a week with little kids every summer so we can color, and eat marshmallows, and sing into fans, and play with sidewalk chalk, and play in the hose, and eat homemade ice cream on the porch and go to parades and stuff. I guess you and Lisa can even come, too. If you both promise to behave. my first visit to your blog. love your bio. love your header. love the muddy shot. 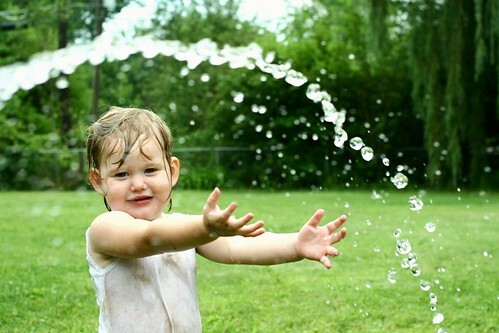 i so know those days, when the hose is the only option! Saw your tweet .... I often dream about swimming and I can breathe underwater. Great pictures! I love the little baby braid. I swam EVERY DAY in the summer. I really love the 2nd and 5th ones. The composition and perspective make them both really interesting photos! Great captures! 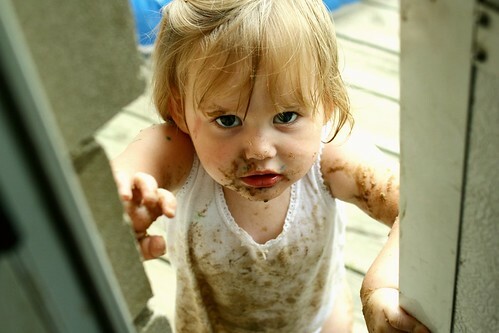 Oh that muddy baby face... so cute! I love the way you've captured the water frozen in time. We just now went outside to play in the water. But I forgot to remember that our grass was freshly mowed. Which made little babies covered in freshly cut grass...so I had to bathe them all when they came in. Pretty much defeated the purpose all together. Too funny! 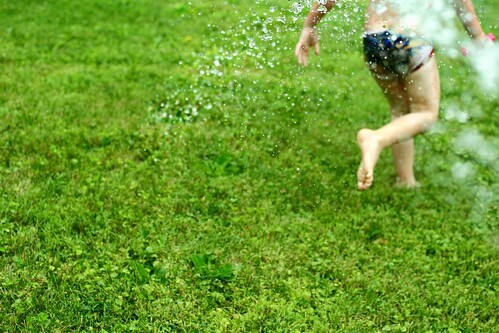 I love the shots of the kids running from the hose! WHEN DID ALICE GROW UP?! Oh my gosh! so beautiful! i'm telling you... just look at how your photos have evolved (and they were never even close to bad before) over the last year. just sayin. These shots are great. The first one especially. those days are the best! The new pictures in your header? Awesome. That top picture of a muddy-faced Alice? Adorable. These images are so nice.